This year, the English Olympics took place in the NMS Alland. Eleven schools participated and four kids from each school were on the team - it was strictly English! English skills were required but the most important ability was teamwork. There were eight stations for the competition: art & music, reading, general knowledge, text, surprise, film, fun & sport and time for small talk. Our school succeeded with the 3rd place. We´re proud of our pupils! Well done Daniela, Esra, Jasmin and Karnita. 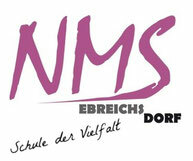 It is an honor for the NMS Ebreichsdorf to win a trophy.